BERKELEY — This week’s broadcast of “APEX Express” on Thursday, Sept. 20, at 7 p.m. on KPFA, 94.1 FM, will include the recording of a community meeting convened in Oakland to reclaim the legacy of Richard Aoki. “APEX Express” staff and guests in the broadcast booth. This panel discussion was held Sept. 9 at the EastSide Cultural Center in Oakland in response to recent reports that Aoki, who died in 2009, was an FBI informant during his time with the Black Panther Party and other Bay Area political organizations in the late 1960s. Speakers included scholar Diane Fujino, author of “Samurai Among Panthers”; Bobby Seale, co-founder of the Black Panther Party; Tarika Lewis, the first female member of the party; and Emory Douglas, the party’s minister of culture. “APEX Express” and Hyphen Magazine were the only media outlets trusted to record the event. The hour-long broadcast will also include a walking tour on 100 years of radical South Asian history in Berkeley, and a tribute to John Vietnam, a 19-year-old poet, emcee, b-boy and dedicated community member who recently passed away. “APEX Express” is a weekly magazine-style radio show featuring the voices and stories of Asians and Pacific Islanders from all corners of the community. 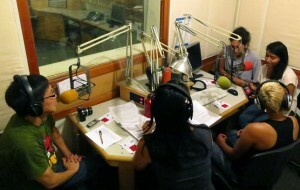 The show is produced by a collective of media makers, DJs, and activists. Listen live online at www.kpfa.org. For more information on the show and to download a link to subscribe to the podcast, go to http://apexexpress.wordpress.com/. The audio archive of the Sept. 20 show will be posted on Sept. 21.